Life can be frustrating. There are times when you think you’ve done good at something but lo and behold you’re told in so many words that your good isn’t good enough. What do you do? Situations like this make us want to cower under a rock or just give up. But there is hope. Competition is one of the main reasons that good isn’t often good enough. An Olympic swimmer just barely missed the gold medal… A bowling team lost the championship by one point… Your arch rival at work got the promotion instead of you… The examples are endless, and in every case those who weren’t good enough came behind. 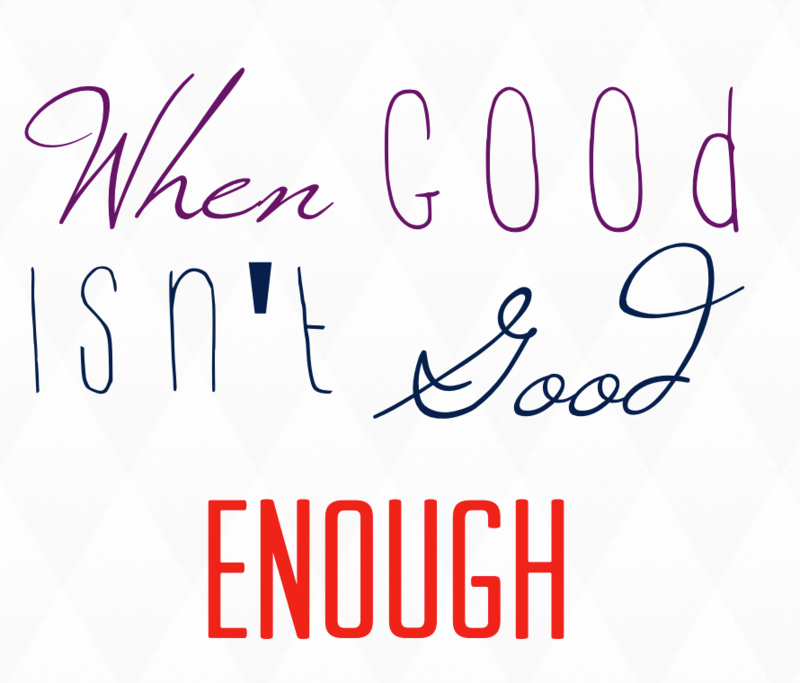 Have you had a recent experience that taught you your good wasn’t good enough? If so, take heart — we all have — we all do an a regular basis — nobody is perfect. Perfectionism is another reason for frustration. When you believe you or what you do must be perfect, you are likely to live in fear of not living up to the standard you’ve set for yourself. Some people are perfectionists — their good is never good enough because they aim for perfection. Being proud of what you do helps you to do your best, but sometimes that isn’t even good enough. The Bible tells us to be perfect as God is perfect. Wow! That’s a high calling. That seems to be an impossible goal. But realize it is a goal. The same Bible tells us that we can’t get it right all the time. We will “miss the mark” often. Did you know one of the most common words used for “sin” in the Bible means “miss the mark?” It does! You aim for perfection but you fall short — that’s what missing the mark is. But in those cases we have relief. I John 1:8,9 If we say that we have no sin, we deceive ourselves, and the truth is not in us. One of the keys to victorious living is to realize and admit we are not perfect and won’t be until Christ returns and perfects us himself. We have carnality in our being, we are mortals with the spirit of God as well as the spirit of man. Romans 7:14-21 For we now know that the law is spiritual, but I am carnal, sold unto subjection by sin. For that which I do, I do not understand, and not even the good that I desire is what I do; but what I hate, that is what I do. So that it is no longer I that do it, but sin that dwells in me. And I know that in me (that is, in my flesh) dwells no good thing; for I have the desire, but I am not able to perform that which is good. For I do not do the good that I desire; but the evil which I do not desire, that I do. And if I do that which I do not desire, I am not working, but sin that dwells in me. So that, desiring to do good, I find this law: evil is natural unto me. but I see another law in my members which rebels against the law of my mind, bringing captive unto the law of sin which is in my members. This information from Romans clears things up quite a bit. While we strive to be all God wants us to be, we have a competing nature — the carnal old man nature warring against us. But don’t just stop at the end of Romans 7… the answer to this dilemma is in Romans 8. When your good isn’t good enough, don’t despair. Get back up and start again. Not everyone can be number one — only one can be. Do your best to attain whatever it is you are doing and accept the results wherever they fall. Review your activities or performance and see if you can find out what held you back. If you find something, do your best to correct it. If you don’t find anything, just work harder on what you did that worked correctly and almost got you to that finish line, whatever it was. Most of the mental anguish we experience is put upon us by ourselves. Sometimes we have unrealistic expectations. Sometimes the expectations are real but we are missing a technique or a piece of information that will help us get beyond our good not being good enough. Try to realize it’s not always your fault. You were born imperfect so don’t expect everything you do to be perfect. I have a high propensity to perfection. Trying to be perfect has cost me more than I care to share, but I’m getting over that now. If I wait until I’m perfect at something, I’ll never get to the point of finishing what I start. Improvement often comes through diligent practice, practice, practice. In the meantime, be thankful for who you are in Christ — that’s the real perfection — and realize one day you will be perfect as Christ is perfect. Don’t let your imperfections get you down. Just do your best to love God, love others as much as you love yourself, and let God help you be the person He’s called you to be. God isn’t looking for perfect people, He’s in the business of taking ordinary people like you and I and transforming them into gems of His handiwork. He will never leave you nor forsake you. You are His and He loves you more than you realize. When your good isn’t good enough, just do your best and let God do the rest.